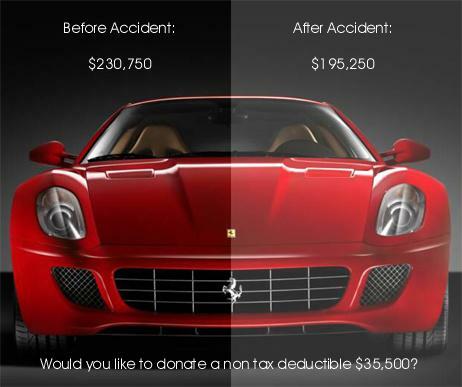 Would you pay full price for a car that has been in an accident and repaired? Of course you wouldn’t and neither will the next person who buys your car if it’s been in an accident. The loss in value for no other reason than it has an accident history is called Diminished Value. Diminished value is a form of property damage that is covered by the at-fault party’s insurance coverage. What this mean is that if you were at-fault, you cannot claim Diminished value for damages you are liable for. But if another person is liable in the accident, then you can file a claim with their insurance for Diminished Value. How will anyone ever know your can has been in an accident? Repaired damage is usually visible from the underside of the car, Carfax reports most insurance claims and you are required by law to disclose repaired accident damage if asked. What are the factors in determining how much Diminished Value you have suffered? What the car was worth prior to the accident and the severity of the damage as detailed in the final repair invoice, damage to the frame or unibody and even a significant number of panel replacements or repairs are some of the factors that determine how much Diminished Value you have. The only real way to determine the value lost is a market analysis and the severity of the damage repaired in the accident. Call your local Auto Appraisal Network appraiser who can estimate the Diminished Value of your car as a result of an accident.